A few weeks ago, we gave Convince & Convert readers the chance to take a free assessment ($37 value) to determine how the world sees them – and more than 600 people participated. The assessment and the methodology were created by Sally Hogshead, a consultant, hall of fame speaker, and New York Times best-selling author. 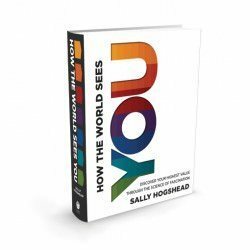 I recently chatted with Sally about her new book How the World Sees You (upon which the assessment is based) and the interesting commonalities among Convince & Convert readers. Video below, partial transcript below that. Jay Baer: I think a lot of people watching this video who are frequent visitors to the Convince & Convert blog are somewhat familiar with the book and the premise because we had hundreds and hundreds of blog readers and social media contacts of mine take the pre-assessment. We’ll talk about that in a little bit but for anybody who’s not familiar with the book or the premise of How The World Sees You, maybe you can set that up for them. Sally Hogshead: Sure. There are certain situations that give you a huge advantage in communication. When you can focus on these types of situations, you’re very likely to be impressive and influential with your listener. There are patterns within your communication that if you could predict which types of situations are going to put you at a real advantage, so that you’re seen in the absolute most positive light, then you can be very strategic about how you communicate with clients, co-workers, partners, etc. On the other hand, there are other situations that put you at a real disadvantage in which you’re very unlikely to be seen in a positive light. You’re not going to win, you’re going to be exhausted, you’re going to be de-moralized. I took my branding background, my decade of work with brands like Coca Cola, Nike, and I applied it to personality, and how we communicate on line, and in job interviews, and in meetings with prospects. I found that there are really clear patterns within our communication that if you can understand how people see you at your best, then you can simply focus on those areas where you’re most primed to succeed and avoid the areas that are going to be like quicksand. Jay Baer: Who couldn’t benefit from that? I mean everybody in every job and every circumstance. Tell me how that extends to social media. One of the things I love about the book is you talk about this “tag line for yourself.” Can you use your fascination advantage, how the world sees you and apply that in social media? Sally Hogshead: Imagine that experience in looking at your Twitter feed or at Tweetdeck. There’s a fire hose of information coming at you, there’s simply too much, you feel distracted. One Tweet starts to blend in to another. The same way in the job market. It’s the same way in conversations, it’s the same way we’re trying to pick up with somebody at the bar seat next to you. Any time you communicate, you have to figure out how can you win in that immediate first moments of an interaction? What I found is that once we can measure your personality, then we can tell you the five adjectives that are going to be your most effective way of communicating. When you read the book, you take the assessment and it literally gives you the actual five words that you need based on the patterns hidden within your communication style so that you can literally cut and paste this, and put it on your Linkedin profile. Where you can adapt it, or it might just be a mind set. It might be that you could say to yourself, I am most likely to win in situations in which I’m going to be creative out of the box, social, energizing. That would be mind, I’m a catalyst. I know that when I’m communicating with my Twitter followers, or writing a new business proposal, I would be seen in my most positive way and I will deliver the most value when I can be creative out of the box, energizing, and social. I’m not going to deliver value when I have to be meticulous, analytical, strategic, methodical. I can do it but I’m at a real disadvantage if that’s what they want. In the same way, when you take the assessment it tells you the top five advantages that you need, and then you go to the book, and it shows you exactly how to apply that in creating a tag line for your personality. Jay Baer: One of the things that we did in the run up to the release of your book, was we had Convince & Convert readers who wanted to take the assessment do so. We had six or seven hundred people who read the blog actually went through the How The World Sees you process. We thought it would be fascinating to see where the majority of Convince and Convert readers lie on that continuum. Is there a grouping? Are there different characteristics that are more likely to be present among people who read this blog and follow me on social media, etc. What did you find out Sally? Sally Hogshead: The population of people who took the assessment is different than the average population. There were two categories where your readers tended to fall more so than the general population. The first one is prestige which is all about higher standards. Prestige personalities know how to improve things. They are competitive, they like to over achieve, they like to constantly see how can I improve what I’m doing? How can I up my game? The second thing that we noticed is that they score very high on mystique. Mystique is all about watching and observing. Being able to see all those little pieces and put them in order in a way that’s almost like a chess game. People in social media circles tend to score much higher on mystique because they’re really good at taking everything in and seeing. To be able to build conversations strategically and to look at things in terms of a plan. Jay Baer: One of the things I thought was so fascinating about that exercise and getting all the people to fill out the assessment in my community and many other communities, is that it gives everybody a taste of the book before the book comes out. Which is, as an author and as a content marketer, is a brilliant, brilliant strategy. It’s truly fantastic. But you were telling me before we began here that you actually changed your own approach to content and book marketing in the very late stages of the book promotion process. Tell me about that a little bit, it’s interesting. Sally Hogshead: We realized we were treating the book launch more like a traditional media buy because we weren’t creating a dialogue. So, we did three things that were pretty radical shifts along the way that were very uncomfortable that not only taught us a lot, but got the results that we wanted. First thing that we did was, we had always charged for the assessment. It’s $37 a person, and when you buy the book you get one assessment. We were kind of coming from a place of scarcity because this was a product that we sold. We said instead of creating a barrier to getting a taste of this, what if we did the opposite, and not only made it free, but actually encouraged people to share? I’m going to be honest, my team totally freaked out. It was like, how could you possibly take the thing that is sold on the shelf that’s our inventory . . .
Jay Baer: There’s Youtility and then there’s insanity, right? There’s a fine line there. Sally Hogshead: I knew from branding that if you can give somebody an experience and they find value in that experience, they want to come back for more. So I said let’s create something that we called project fascination. You can check it out at projectfascination.com. We invited people to sign up and throughout the summer you put in your name, you immediately get a code, and the code allows you to share with a hundred people, your Twitter followers, your team at work. We were finding people were donating their code to a non-profit. It was a complete shift of pay it forward and help somebody else find their highest value. That helped us. We now have about 2,000 people a day who come into that program so that helped us scale quickly. Another thing we did is we had a whole bunch of what are called galley copies. Galley copies are a paperback version that only goes out to the media. If I buy this from the publisher, you can see it has my notes on it, it was $2.00. If I buy this from the publisher it’s $20. We said, let’s have 6,000 of these so we created buy one get one. If you buy a produced copy, then you get a galley copy signed. The last thing we did is we created very, very targeted messages that were specific to the personality type of the person. Jay, you are very achievement oriented, you’re results oriented, you want to know what’s going to be the outcome. You don’t really want to get in the weeds, and you don’t really want the touchy feely thing, you want to know what’s the result, right? So I should communicate to you differently. So imagine if I’m sharing about this book, I wouldn’t want to be like, this book is going to make you feel warm and squishy inside. I shouldn’t say this book is going to help you prevent problems. Instead I should say, “Hey, this book is going to help you get better results, and you’re going to be more competitive, and more respected within your market place.” Well for you, if I can give you some tangible examples of that, ding, ding, ding. We did that with each of the seven personality types. For the passion personalities we talked about, here’s how you’re going to feel when you read the book. For detail personalities we made it all about the research behind it and the rigor of the system. Jay Baer: There are 49 different personality buckets, do you grade on a curve? Are those evenly distributed, or are there certain buckets within there that are much more likely to be common among people who take the assessment. Not just in my audience, but across everybody who uses the assessment tool. Sally Hogshead: There’s some that are really rare, and those are the people who are often the most valuable. In other words, if everybody in your company is really good at a certain thing, and you’re good at this, well then you should become more intensely valuable. The problem that happens within companies is there’s a value judgment on certain types of outcomes because managers want to replicate themselves. 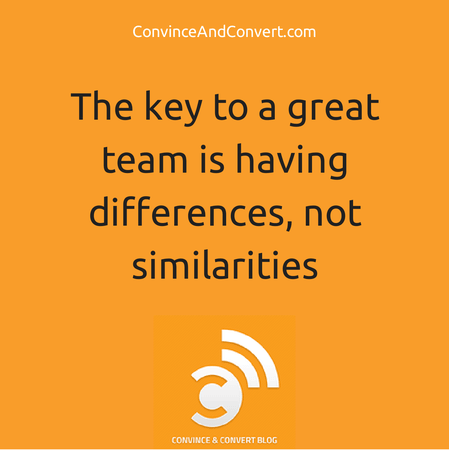 The key to a great team is, you don’t want similarities, you want differences. When we go into companies like AT&T and GE and we measure their population, we compare it to the average population, and we compare it to other industries, then we can say. For example, there’s a Fortune 10 life insurance company that we went into. Their problem was that people were staying so there was a lot of tenure among their employees, but there was no innovation, and they weren’t bringing young people into the brand. We tested them, and guess what, they were disproportionately good at trust, so great at patterns, but disproportionately low at creativity and innovation. We showed them how to hire differently and how to bring it out in people that already had it but were probably getting squashed. Jay Baer: That’s amazing case study and I suspect organizations like that have this nagging suspicion that something is mis-aligned, but when you see it broken down that way, when you see it, here’s your entire work force and when they tend to clump in an area that doesn’t necessarily breed innovation, I’m sure the light bulb really goes on when you see it on paper like that. I suspect a lot of people in the Convince & Convert community have purchased the book because they got the assessment, they loved it. If you haven’t, I really recommend that you do. You will get a lot out of it. If you don’t like the book, but you will, but if you don’t, I’ll send you one of my books for free. If you don’t like my book or Sally’s book, I don’t know what to do. We’ll hook you up one way or the other. Also, if you get a chance to see Sally up on stage, she is one of the finest public speakers ever in this country. I don’t say that lightly so she’ll be up there, out on the road talking about How The World Sees You and fascination. If you get a chance to see Sally anywhere near you, take that opportunity. I really can’t recommend it highly enough.